The business model of Santa Claus is an age-old business model over 200 years old. Santa is a legendary figure originating in West Christian culture who is said to bring gifts to the homes of well-behaved children on Christmas Eve. Santa Claus is generally depicted as a portly, joyous, white-bearded man, wearing a red coat with white fur collar and cuffs, white-fur-cuffed red trousers, and black leather belt and boots and who carries a bag full of gifts for children. How come the business model of Santa Claus is still valid? The image of Santa Claus has been maintained and reinforced through song, radio, television, children’s books, films, and advertising. Business wise we can learn a lot from Santa Claus. The use-by date of business models becomes shorter and shorter due to a continuously changing world. It’s a real achievement that Santa has lasted so long. What is the key to his success? What can we learn from his business model? 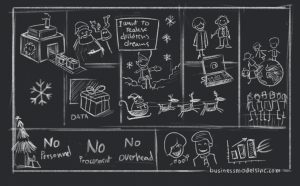 In the following post we’ll use the 9 building blocks of The Business Model Canvas to tell this story. First of all, Santa Claus has a clear and strong ambition and value proposition. His ambition is to make children’s dreams come true and his promise is to give everyone an unforgettable Christmas day. How does he do that? Through his unique gift delivery service. Have you been naughty or nice this year? Santa is reaching a mass market. Regardless of age, origin or gender, Christmas touches a lot of people worldwide. You could also argue that Santa Claus is not able to make a choice on his customer segments. We love to spend time together at Christmas. Worldwide we spend billions of dollars on Christmas gifts. According to Forbes, Christmas shopping in the US with more than 1 trillion in expenses accounts for 25% of the annual Retail income. But we also spend time and data, which is very important. We tell Santa Claus our greatest wishes. Santa Claus always delivered the gifts with his carriage ride, but nowadays he is in the ‘cloud’ with his sled and various home delivery services help him with the delivery. Santa reaches us both physically and online. 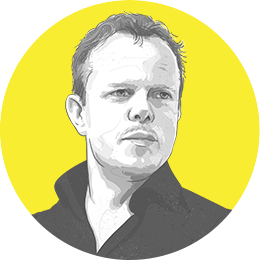 Especially the internet has grown enormously as a shop platform. We buy more and more Christmas gifts online with our smartphones. Physical Christmas shopping also remains popular. Santa is a master in building his customer relationships. Who is not crazy about this old man, with his white beard, pointed hat and round belly? He also creates true communities by connecting people with each other and being the subject of conversation both at home and at work. Moreover, he uses nostalgia through the pleasant memories of the past. Santa Claus is a true storyteller. In addition, he spends most of his time on properly understanding each person’s personal situation and wishes. He knows everyone in a very scalable and ingenious way and he knows how to turn this information into personal attention. Santa himself is a love brand. His ‘customers’ want to belong to him. Everything with his image on it, rises in value. He really knows how to affect people. His platform is also essential. Connecting people creates value. Finally, the data he collects makes it possible to always make a difference and to surprise and touch everyone, year after year. Just like a Facebook, Santa Claus does not create all stories and content himself. He uses his community for that. Besides the fairies and his reindeers, the fans of Santa Claus are also indispensable in delivering value. They decorate, tell stories and help with the purchase and packing of gifts. As Uber and Airbnb do not have taxis and hotel rooms, Santa Claus does not buy the gifts himself. That would be too much work and too expensive. By engaging fans for this, his business model is very scalable and cost-effective. Why is the business model of Santa so successful? 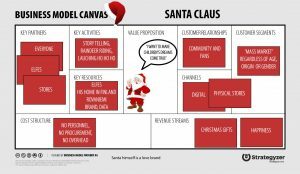 Besides being a master storyteller and everyone’s friend, Santa Claus is also a master in business model thinking. In achieving a mass market, building a community of fans that work together to create value, by collecting data and converting it into personal attention and thereby creating a love brand. Something to take with you for under the tree. Merry Christmas!